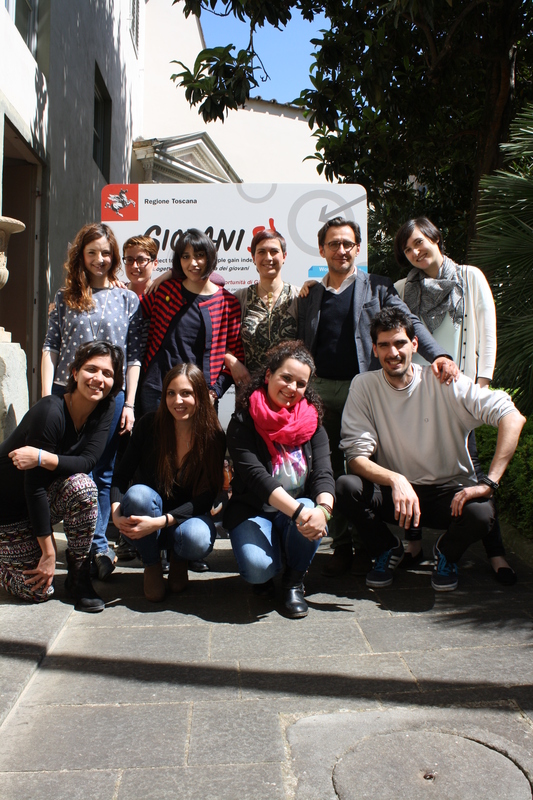 Giovanisì is the project promoted by Regione Toscana to help young people become independent. It is financed by regional, national and European funds (2014-2020 programming period, ROP ESF – ROP ERDF – RDP EAFRD) it is based on 7 main areas: Internships, Housing, Civil Service, Entrepreneurship, Education and Training, Employment and Giovanisì+ (which includes projects and initiatives in fields such as participation, culture, legality, sport and social issues). 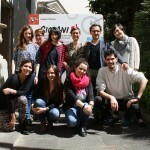 Giovanisì started in June 2011 with the aim to integrate the existing youth policies at regional level and, at the same time, to create new lines of interventions. More than € 1 billion have been allocated to the project since its implementation. More than 298.000 the young beneficiaries of the project. The project is aimed at young people up to 40 years old, different age restrictions apply to different areas of the project. 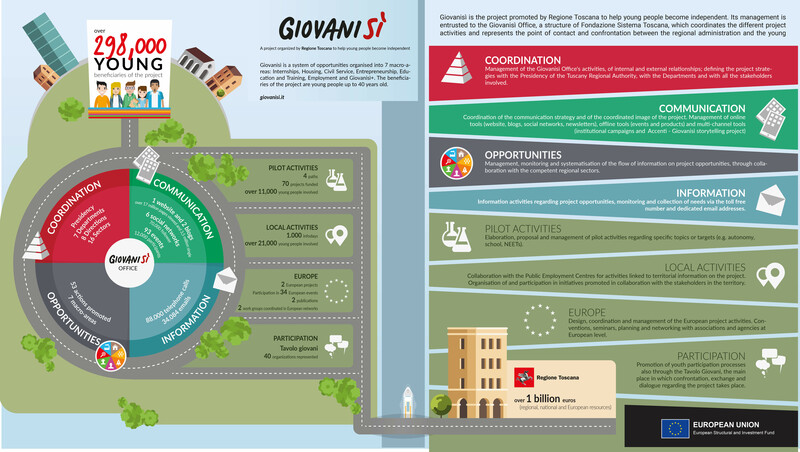 From May 2014, Youth Guarantee-Regione Toscana was integrated into Giovanisì. Giovanisì is managed and coordinated by a dedicated office based at the Presidency of the Region of Tuscany. Non-curricular internships give young people the chance to train and prepare for the labour market. Regione Toscana co-funds non-curricular internships. The target group is young people 18 to 29 year olds. Direct beneficiaries: Companies throughout Regione Toscana co-fund the internships by providing €300 of the €500 required monthly by law to go towards covering the expenses of the internees’. Curricular Internships and Professional Apprenticeships: Unlike non-curricular internships, companies or public bodies in Tuscany are not obliged to pay internees still in formal education, such as studying for a primary degree, a post-graduate master degree, a PhD or an apprenticeship to learn a profession. However, in order to promote paid internships during education, Regione Toscana provides €300 to the companies or public bodies that give at least €500 to young internees. In order to help young people to move out from their parents’ homes and become independent, Regione Toscana contributes towards a young people’s rent. The level of contribution varies from €150 to €350 a month for 3 years, according to the young person’s income and whether they have children. The target group is young people aged between 18 and 34, who have been living at home in Tuscany for the past 2 years. Healthcare – Environment – Education – Culture – Social care – Civil defence – Immigration – The protection of consumers’ interests – Equal opportunities – Fair and ethical trading – International co-operation. These civil service projects are financed for a period of 8 months with a contribution of €433 a month, directly paid by Regione Toscana to the young people involved, and they are run by registered local NGOs and local authorities. The target group is young people aged between 18 and 29. To support the right of young people to education, training, learning and specialisation, a series of incentives, such as vouchers, scholarships, vocational education work programmes, have been put in place in order to endorse talent and commitment. To make it easier for young people to start a business, Regione Toscana implemented different lines of intervention in the field of entrepreneurship. In particular, Regione Toscana supports the start-up and the enterprise stabilization, giving grants to cover expenses and by promoting micro-credits initiatives. In addition, specific attention is given to start-up businesses in the agricultural sector. Grants of the amount of €40,000 are provided to young farmers who want to start up a new company. The target group is young people aged between 18 and 40 and business start-ups run by youth. Regione Toscana provides incentives for youth that want to start-up a business within a co-working space in Tuscany by providing voucher for co-workers under 40. Follow us on Accènti, Giovanisì Storitelling project: ambitions, dreams and hopes of the young beneficiaries of Giovanisì project, told through images and words within a book, a blog and videos.